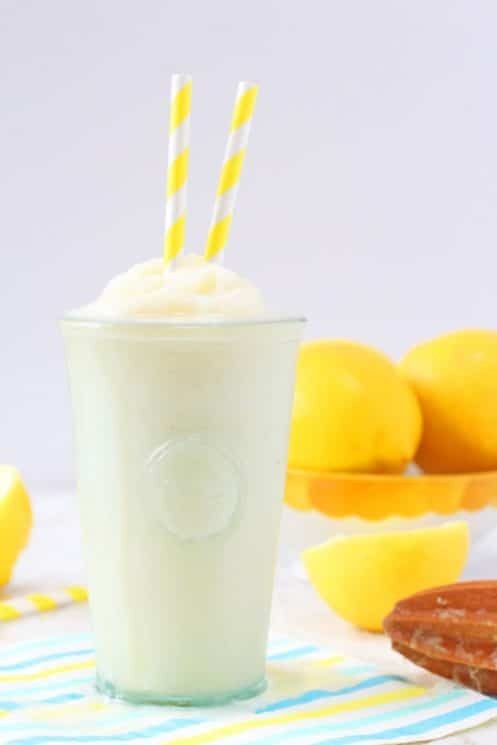 A delicious and refreshing recipe for homemade Frosted Lemonade made a little healthier! Hi, it’s Ciara here from My Fussy Eater. I’m delighted to be back here on Super Healthy Kids sharing some of my ideas and recipes for picky eating families. This month I’m sharing my recipe for this really delicious summer treat made a little bit healthier. 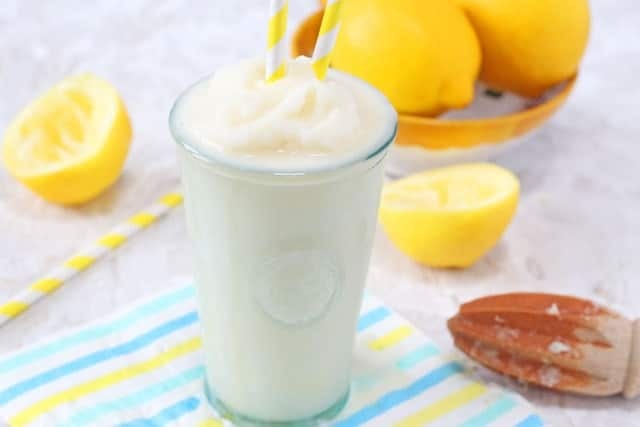 On a warm summer’s day there’s nothing like a big glass of refreshing Frosted Lemonade. 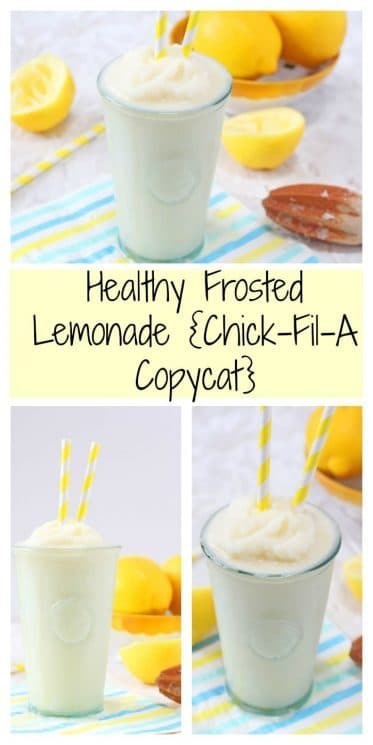 But the store bought versions, usually made with lemonade and ice cream, are loaded up with sugar and turn what could be a simple snack into a very unhealthy drink. So with summer on its way I thought I would try to make my own homemade version a little healthier. 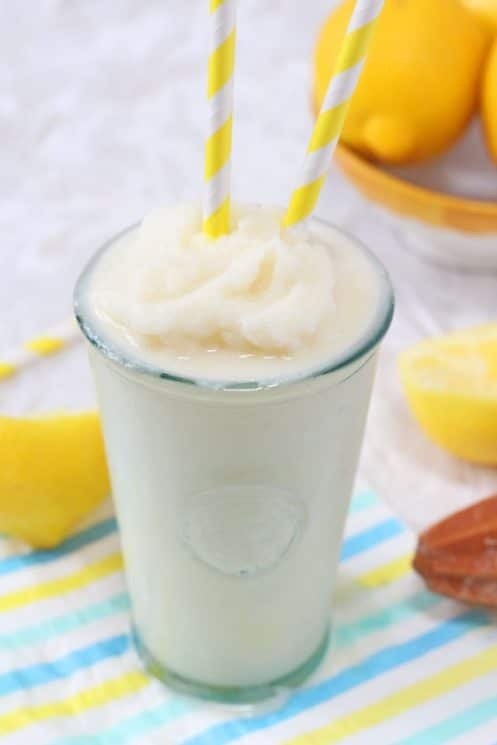 I’ve swapped the sugary lemonade for fresh lemon juice and switched the ice cream for frozen yogurt. When choosing your frozen yogurt I would recommend reading the labels as the sugar content can vary quite dramatically. Go with one with a low sugar count or even better, make your own at home! I haven’t added any extra sweetener to my recipe as there was a small amount of sugar in the frozen yogurt I bought, making the drink sweet enough. However if you are using a completely sugar free fro yo then feel free to add 1-2 tbsp of honey or maple syrup to the mixture when blending. We used our Blendtec for this and it made the texture amazing! It just makes things SO smooth. If you haven’t check out their new design hop on over to Amazon, but it is amazing!! So many more features and the screen tells you if you need to add more liquid and all sorts of cool things! The great thing about this recipe is that it doesn’t taste like you are missing out at all. Our few simple swaps have made this drink a lot healthier without compromising on the taste! 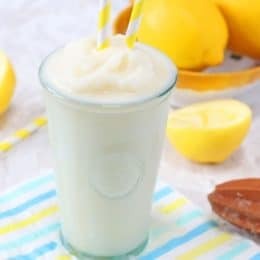 I am a big fan of all types of homemade lemonades. What do you think about adding some peeled, deseeded cucumber to this one? I can imagine it sounds odd but flavour and smell of cucumber seems very refreshing to me. (There is no better drink during hot summer than water with slices of lemon, cucumber and fresh mint leaves). I find that many frozen yogurts have the same ingredients that ice cream does. Do you have some more suggestions on frozen yogurt? There are like 70 grams of added sugar in this and you talk about it being healthy and even worse you recommend it to kids.